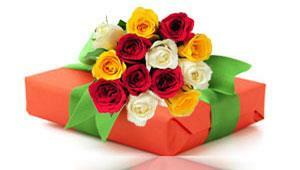 Multi day Hamper Day1: 50 Red Roses Tall Basket (2ft), 1Kg Heart Shaped Strawberry Cake. Day 2: 100 Red Roses in a Heart Shape, 1 Kg Heart Shaped Chocolate Cake. 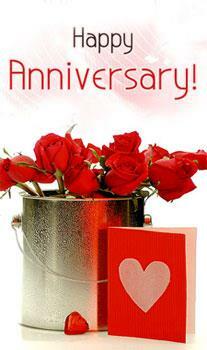 One day is not enough to express your love. 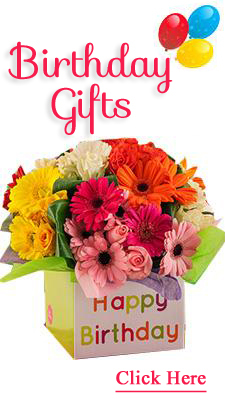 Its time to woo her with beautiful gifts like this serenade hamper. 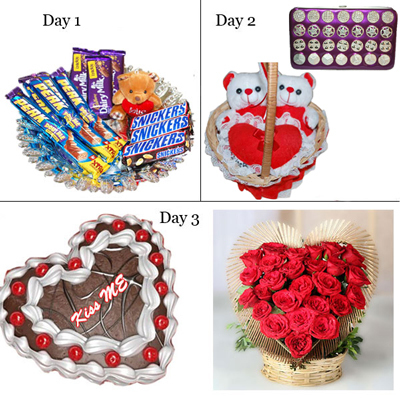 Day 1: 20 red roses flower bunch wrapped with Decorative paper + Delicious heart shape Chocolate cake -1kg Day 2: Dancing Couple Pair - Pop Pair (Code 19825) + Dairy Milk Silk Caramello Chocolates - 3 bars + Perk Chocolates - 5 bars + Heart shape cherir chocolates Box - 8 pieces + Square shape thread basket with handle Note: please mention the starting day date as Delivery date of serenade gift hamper in shipping instructions. 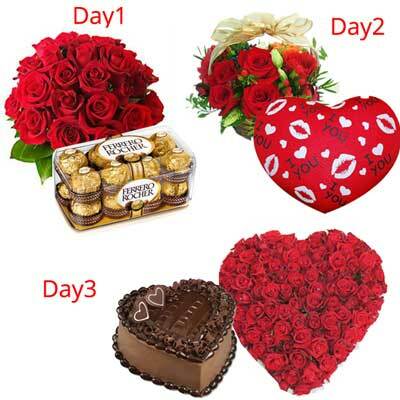 Multi day Hamper Day 1: 25 Red Roses flower bunch wrapped in a decorative paper + Delicious heart shape chocolate cake -1kg Day 2: Cadburys Bournville chocolates - 3 bars + Cadburys Fuse chocolates - 3 bars + ferrero rochers chocolates pack - 6 pieces + Small Teddy bear + Thread basket + Crystal Valentine stand with Lighting - 1202-010 Note: please mention the starting day date as Delivery date of serenade gift hamper in shipping instructions. 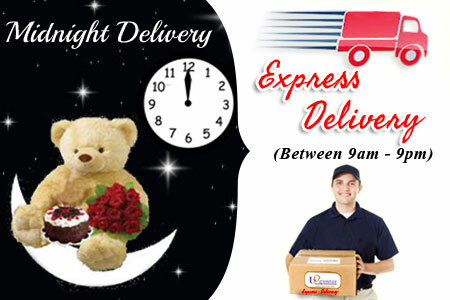 Multi day Hamper Day 1: Special Basket Arrangement with Fresh 30 Red Roses + White Teddy BST 3701-010 Day 2: Yummy delicious heart shape chocolate cake -1kg + Nutacious Wafer Ball -8 pcs-013 Note: please mention the starting day date as Delivery date of serenade gift hamper in shipping instructions. Multi day Hamper Day 1: Cadburys Fuse Chocolates -5 bars + Crystal Valentine stand with Lighting - 1205-002 +Love is Magical Miniature Book Day 2: Heart Pillow - BST3606-002 +Parker Red Ball Pen + Heart shape vanilla cake with cherries 1.5 kg Note: please mention the starting day date as Delivery date of serenade gift hamper in shipping instructions. Multi day Hamper Day 1: 50 Red Roses Heart shape Flower arrangement + My Love Just for You Miniature Book Day 2: Cadburys Dairy Milk Silk Bubbly chocolates - 3 bars + Cadburys Fuse chocolates - 3 bars + Laxme Nail polish + Laxme Lip stick + Tray Day 3: Heart shape soft toy - PST 1591-4 + Delicious round shape vanilla flavor cake - 1kg Note: please mention the starting day date as Delivery date of serenade gift hamper in shipping instructions. Day 1: Heart - PST-926(SMALL) -25 Size: 16cm * 11cm+ Love Mug + Beautiful Flower Bunch with 25 Red Roses with decorative paper wrapped Day 2: Yummy delicious heart shape chocolate cake - 1kg + 20 red roses flower basket with fillers Note: please mention the starting day date as Delivery date of serenade gift hamper in shipping instructions. 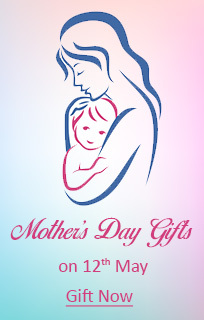 3 day Serenades Note: please mention the starting day date as Delivery date of serenade gift hamper in shipping instructions. 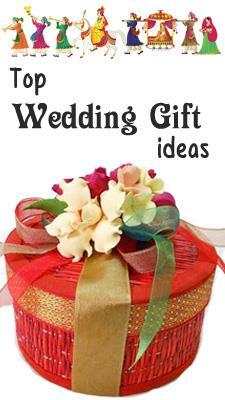 Day 1: RED with White Teddy BST 3703-001 Height:19 cm + Valentine Music Love Box -024, Size : 6cm* 8cm Day 2: 25 Red Roses flower bunch wrapped in a decorative paper + Valentine Big Size Greeting Card -811-006 ( Big Size) Day 3: 50 Red Roses Heart shape Flower arrangement + Heart shape chocolate cake - 1kg Note: please mention the starting day date as Delivery date of serenade gift hamper in shipping instructions. Day 1: Snickers chocolates - 3bars + Cadburys dairy milk crackles chocolates - 3bars + perk chocolates - 5 bars + Silver coated fancy basket + small teddy Day 2: HAND PURSE -9841-001 Size:18 CM*10 CM + Couple Teddy - KT 099-003 Day 3: Heart shape chocolate cake - 1kg + Beautiful Heart shape flower arrangement with 25 Red Roses Note: please mention the starting day date as Delivery date of serenade gift hamper in shipping instructions. 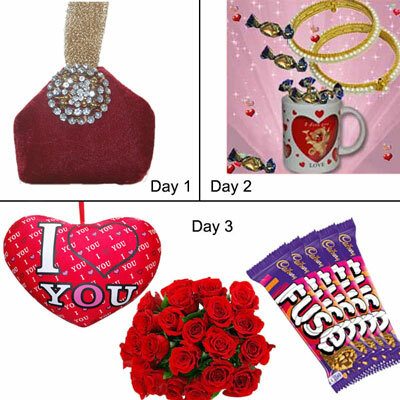 Day 1: HAND POUCH -9968-001 SIZE:11CM*18CM Day 2:Hidden Surprises - Pearl bangles hidden in a Mug with chocolates Day 3: Heart shape Pillow BST 13108- 012 + 12 Red Roses flower bunch + Cadburys fuse chocolates - 5 bars Note: please mention the starting day date as Delivery date of serenade gift hamper in shipping instructions. 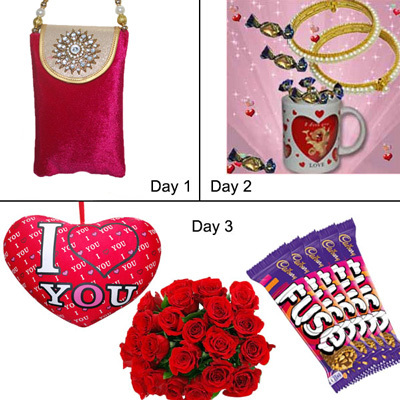 Day 1: HAND POUCH-10015-001 SIZE: 14CM*16CM Day 2:Hidden Surprises - Pearl bangles hidden in a Mug with chocolates Day 3: Heart shape Pillow BST 13108- 012 + 12 Red Roses flower bunch + Cadburys fuse chocolates - 5 bars Note: please mention the starting day date as Delivery date of serenade gift hamper in shipping instructions. 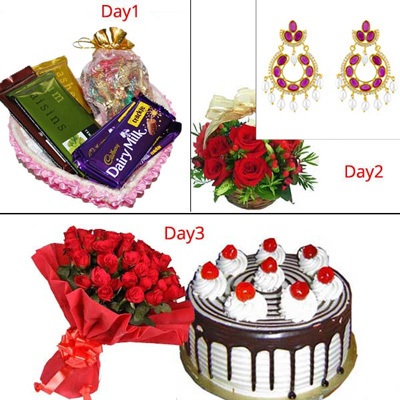 Day 1: Cadburys Temptation chocolates -3 bars + Tiffany chocolates in a pouch + Dairy milk Crackle chocolates -3 bars + Basket Day 2: Maroon Baalis - JPAPR-15-062 + 20 red roses flower basket with fillers Day 3: 20 red roses flower bunch wrapped with Decorative paper+ Delicious round shape chocolate cake - 1kg Note: please mention the starting day date as Delivery date of serenade gift hamper in shipping instructions.